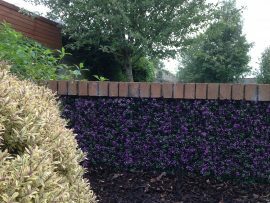 GreenFx artificial hedging can provide a fast & effective solution to tidy, brighten up an area and also provides some privacy. 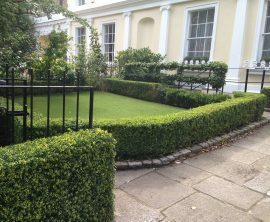 As our hedging is supplied in rolls, on a trellis, panels and also in a boxwood option they can be used in a wider range of applications. 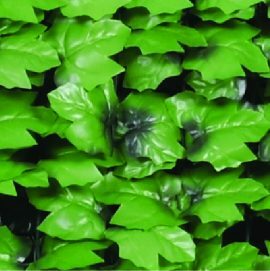 This GreenFx artificial roll hedge provides privacy to a home, garden, balcony, cafe or smoking area. It is available in three finishes, Autumn, Emerald and Amazon. Cable ties are also included. 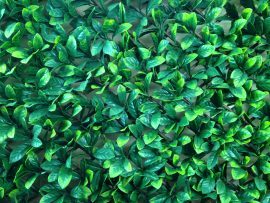 This hedging is available in a 3m x 1m roll which makes it is easier to secure around curved areas and can be used in a wide range of applications e.g. around the bottom of a trampoline or around an unsightly telegraph pole etc. 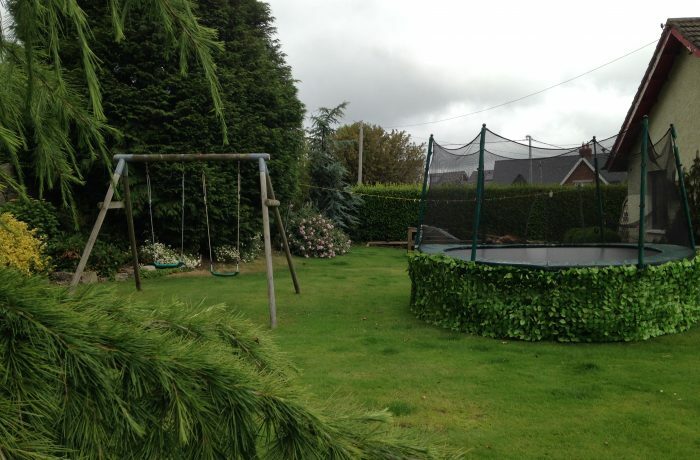 - Provides privacy to a home, balcony, garden, swimming pool, café or smoking area etc. This easy assembled, point of display box is to help promote your message and gain attention and sales in store. 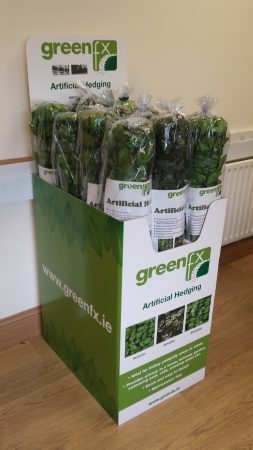 Twelve rolls of our artificial GreenFx mesh hedging fit into display box which is compact and will not take up much floor space. 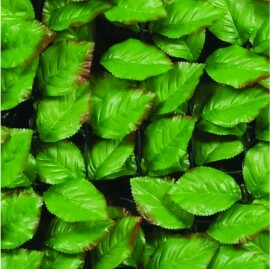 The GreenFX artificial Willow trellis hedge immediately transforms any area. 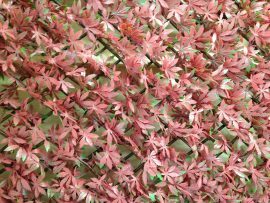 The expanding wooden trellis backing provides an attractive finish to the hedging and is available in three finishes, Red Acer, Savanna and Evergreen. 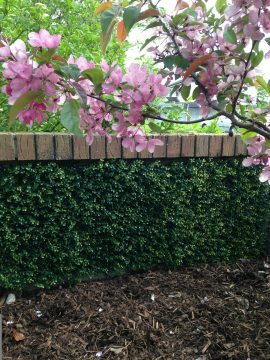 The GreenFX boxwood hedge panel provides a fast & effective solution to brighten up an area or provide some privacy. Supplied in a 50cm x 50cm panel, however each panel easily clicks into another to make the area of coverage bigger. 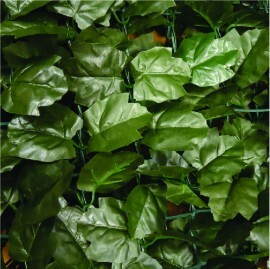 The GreenFX boxwood hedge Is a low hedge and is manufactured around a treated iron frame which provides structure and stability. 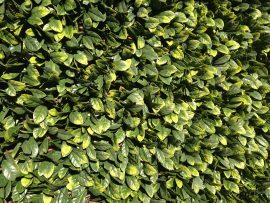 This particular hedge is ideal for creating and instant border around patios or pathways and can also provide privacy screening on balconies and terraces.